​Purdue University’s Boiler Hop Yard has started its second growing season with the hopes of providing Indiana growers with science-based recommendations for hop production in the Midwest. With summer rapidly approaching, hop bines are now climbing over 10 feet high in portions of Indiana, and the Boiler Hop Yard is no exception. Downy Mildew. 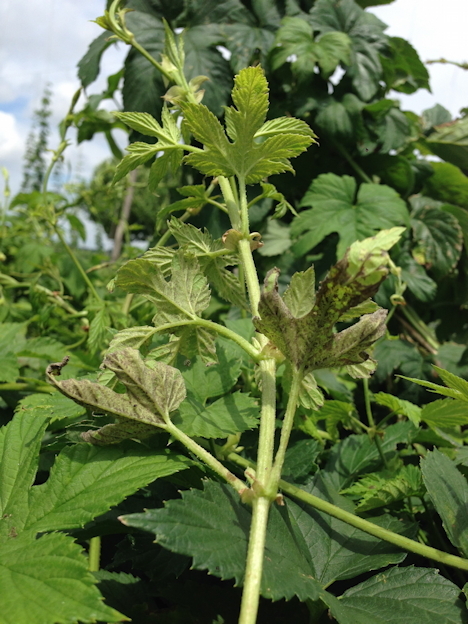 One of the biggest threats to Indiana hop production is downy mildew. Downy mildew (Pseudopernospora humuli) can cause hop quality to depreciate, yield to be stunted, and sometimes even plant death. 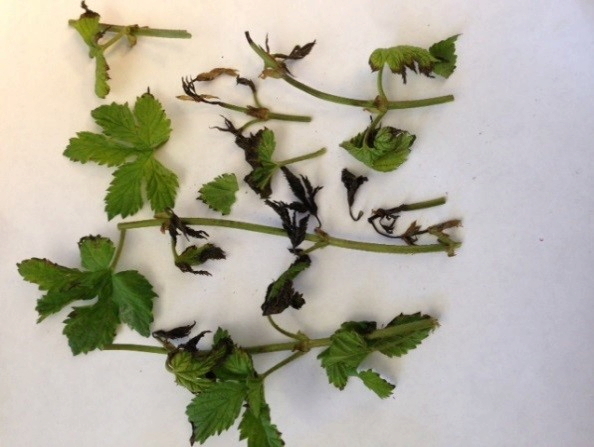 Downy mildew was identified in the Boiler Hop Yard in mid-April this year, and is present in other Indiana hop farms as well. Downy mildew overwinters in the crown of the hop plant, and appears in the early spring on newly emerged primary basal or aerial spikes as a sidearm (Figure 1). These spikes have irregular growth patterns and are undesirable in hop production. The spikes are distorted in length, containing shortened internodes, sometimes appearing chlorotic with yellow leaves that begin to curl as the disease intensifies. There are lesions that develop on the top and bottom sides of the leaves. The lesions on the top of the leaf can appear yellow and angular and then turn brown, while the bottom of the leaf has dark lesions (Figure 2). After time, these lesions begin to develop asexual spore masses on the underside of the leaves which can spread to other plants and cones. If the spikes are not removed, the older leaves are consumed by the disease and begin to die back. One of the best ways to manage downy mildew is through preventative action by planting resistant varieties. Hop varieties that are reported to be susceptible to downy mildew include Cluster, Galena, Centennial, and Nugget, while Cascade, Fuggle, Perle, Tettnanger, Chinook, Columbia and Willamette are reported to be moderately resistant (Johnson et al. 2009). The variety with the most prominent downy mildew presence in the Boiler Hop Yard this season has been Nugget. However, even with resistant varieties, growers need to scout their hop yards regularly to identify and manually remove infected spikes. Scouting has taken place in the Boiler Hop Yard at least twice a week since downy mildew was first identified in early April. Hop plants can also be crowned early in spring to remove infected shoots and encourage development of healthy, vigorous shoots. This mechanical control method removes the top 0.75-2 inches of the crown before buds break through the soil (Darby and Madden 2012). Another way to cope with downy mildew is to develop an effective fungicide spray schedule for your hopyard. It is important to maintain a rotation in spray schedules by varying modes of action because downy mildew can fairly rapidly develop resistance to fungicides (Johnson et al. 2009). On April 23rd Cuprofix® and Tanos® (common name, famoxadone cymoxanil) were applied at the Boiler Hop Yard before an expected heavy rain. Cuprofix® is a basic copper sulfate. Two weeks later, copper and Zampro® were applied, and on May 18th Aliette WDG® (common name, fosetyl-Al) was administered. Zampro® should not be applied more than two times before alternating to a fungicide with a different mode of action. Most recently, Rampart® was sprayed in the hopyard on June 3rd. Spraying will continue in the hopyard as the summer progresses, likely with longer spray intervals during the upcoming drier weather. Frost Damage. Frost damage is another challenge Indiana hop growers may face. During May several hop growers reported frost damage in parts of central and northern Indiana. It should be noted that in some cases frost damage can resemble downy mildew (Darby and Madden 2012). The Boiler Hop Yard experienced frost damage that included necrosis of leaves and die back of young shoots (Figure 3). In the worst cases, the oldest shoots, some of which were “bull” shoots (described below), were stunted and the tip was killed. The plants appear to have completely recovered from the damage, which is usual as frost is often an early season, mild setback. Training. The date that hop bines are strung can have a significant impact on cone yield. The optimal training date varies by site-specific climatic factors as well as hop variety. Consequently, identifying the best training date in Indiana is going to take a bit of trial and error. In the Boiler Hop Yard this year, the large trellis system was strung on May 8th when the bines were ranging from 12-24 inches in height. Once the string was hung, training was started by selecting 3 to 4 of the more mature bines and wrapping them clockwise around each string. It is important to note that the initial shoots that emerge from the ground are not always the best to train. These shoots, sometimes referred to as “bull” shoots, have a hollow center and will not have successful cone production compared to the plant’s secondary shoots. The initial shoots, though large, are susceptible to severe spring weather damage, such as heavy wind and rain, due to their brittleness. In the Boiler Hop Yard, it was not uncommon for the hops to produce up to 3 or 4 of these hollow, fibrous shoots at the beginning of the growing season. The Boiler Hop Yard is also experimenting with a short trellis system (Figure 4). Unlike the tall trellis, which is 18 feet tall and requires annual stringing and training, the short trellis consists of a net that is 10 feet tall. 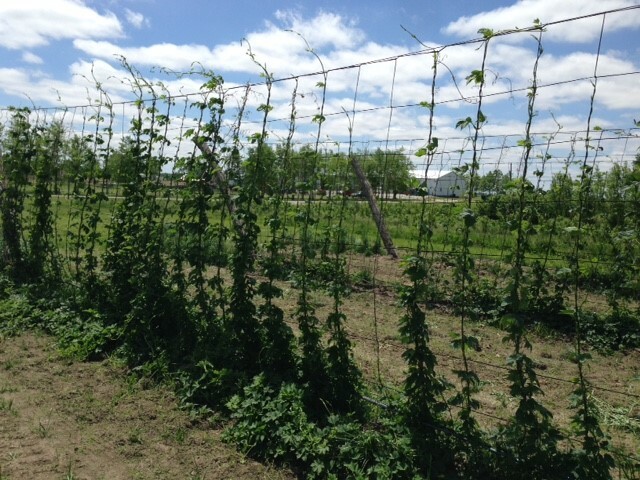 There has been no need to train the hops on the short trellis system because they naturally wrap themselves around the net. The bines on the short trellis are more mature with regards to height than those on the large trellis. The variety Galena has shown the best initial growth on the short trellis this season, with many of the bines climbing to the top of the trellis by late May. On May 19th the first trimming on the short trellis took place, as there were several plants that had already overgrown the net. 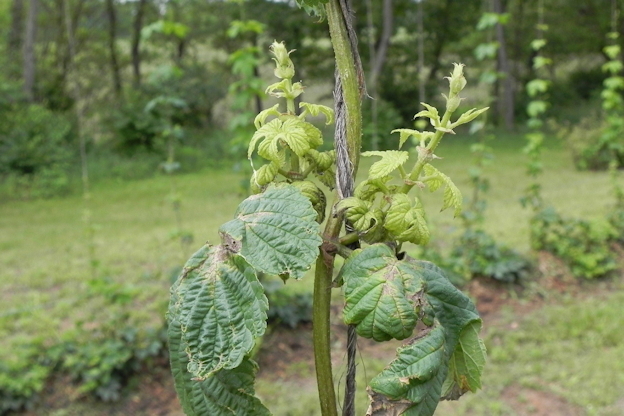 By cutting off the tops of the shoots that had overgrown the trellis, the plants began their outward expansion with the growth of lateral shoots which is where hop cones will emerge. This season there were two new hop varieties added to the yard: Comet and Horizon. Each of these varieties was planted on the large and small trellis systems the first week of June. Fertilization. Developing a sustainable nutrient management plan depends on routine soil tests and an estimate of the total aboveground biomass (bines, leaves, and cones) hop plants are expected to produce. For example, newly planted hops will not produce a substantial amount of biomass in the first year, and thus their nutritional needs will be lower than fully mature plants 3-4 years after establishment. Nitrogen (N) is generally the most limiting nutrient in hop plants, and the one that is the most difficult to manage because it is highly mobile in soil. Consequently, split applications are highly recommended to help reduce N loss. In the first year, the general N recommendation for hops is 75 lbs. per acre, whereas the rate can vary from 100-200 lbs. per acre in mature plants depending on soil organic matter levels. Other major nutrients required by hops are phosphorous (P) and potassium (K), and recommendations generally range from 20-60 for P2O5, and 80-150 for K2O. Based on fall soil tests at the Boiler Hop Yard and estimated aboveground biomass, we decided to apply a total of 125 lbs. of N, and 30 lbs. of P2O5, while existing soil K was expected to be sufficient. The Hop Yard had its first fertilizer application in the middle of May when 75 lbs. of N and all 30 lbs. of P2O5 per acre was applied. The nutrients were applied through fertigation, the process of administering fertilizer through the irrigation system. This initial fertilizer application was done in May because the hops were beginning to enter their training period. As the growing season continues, the hops will be spoon fed additional N fertilizer through the fertigation system through mid-June. It is important not to continue to supply N after plants have begun flowering as this can result in unwanted vegetative growth at the expense of cone yield. Leaf petioles were just harvested from the Boiler Hop Yard, and will be tested to determine if our plants are in the optimal nutrient range. Anticipated Future Management. As the growing season continues and growing degree-days increase in central Indiana, the irrigation system will begin to be more active. With the hot and humid Indiana summer weather comes the need to continually scout for downy mildew, which is expected to remain a common nuisance. There will also be continual trimmings of the short trellis system over the summer months in order to continue encouraging outward growth and cone development. Within the next two weeks, the herbicide Aim® will be applied in order to defoliate the leaves on the bottom three feet of the hops. Insect management practices may also be necessary as the summer continues as the presence of potato leaf hoppers are expected to increase in the coming weeks. Figure 1. Downy mildew on hops. Figure 2. Lesions on the underside of leaves.